Agritouirsm – a loaded word and opportunity in Virginia and the country as a whole. Agritourism by definition is an activity(ies) on a farm that the general public is invited to enjoy. It can range from a winery, a pick-your-own operation, to a corn maze, to whatever your imagination can possibly dream up. It is family fun, it is a great way to spend a beautiful day in the country with friends, and so much more. My reason for going on and on about agritourism is that it is often overlooked as a viable option for a farm to diversify and increase net farm income. That’s right – it can be a missed opportunity to increase your income. For those of us in agricultural marketing and development, we continually encourage farmers to diversify as agriculture is not the same as it was for our grandparents’ generation or even our parents’ generation. As with many things in this fast-paced world, it is rapidly changing and sometimes we can barely hold on. 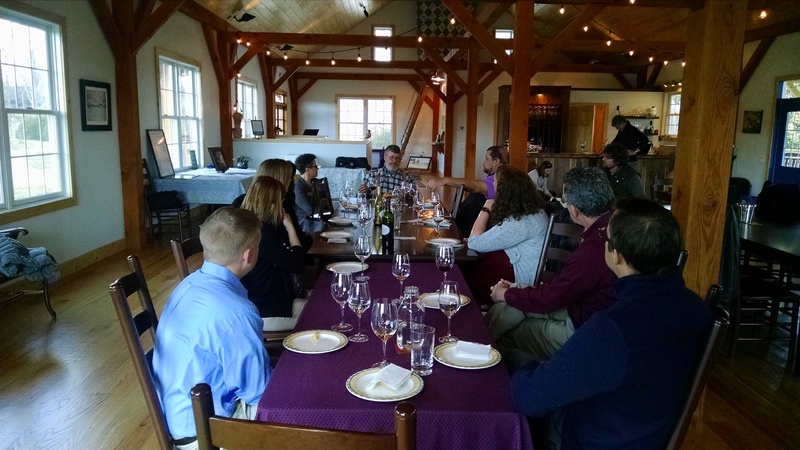 We had the wonderful opportunity to visit the Mill Road Farm and Zephaniah Farm Vineyard in Loudoun County. The family decided to take full advantage of the land and now have a wonderful vineyard and winery, and also raise grass fed angus and sheep that is sold at the local market. They host wine tastings in the farm house, and have built a beautiful barn that allows for parties on the ground floor with the winery in the basement (got to keep that wine at cellar temperature!). This farm is a wonderful example of taking advantage of the entire farm and the skills / interests of the different family members. I was privileged to be a part of the comittee that studied and published the economical impact of agritourism around the state of Virginia. The results were presented at the Virginia Agritourism Conference this past April in Richmond. The overall impact is an astounding $2.2 billion – that’s right it starts with a “B” for billion. And our farms have just begun to explore these opportunities in the last ten years. I can only imagine the impact in another ten years. A copy of the study can be found at the Virginia Tourism Corporation website or if you contact me then I will send you a copy. I will step off of my soapbox with one last statement – if you, your family or friend owns a farm – please give some consideration to diversifying your farm operations with agritourism options. I think you will be pleasantly surprised.